This is the first game in the Legend of the Mystical Ninja series. For other games in the series see the Legend of the Mystical Ninja category. Mr. Goemon (五右衛門 lit. 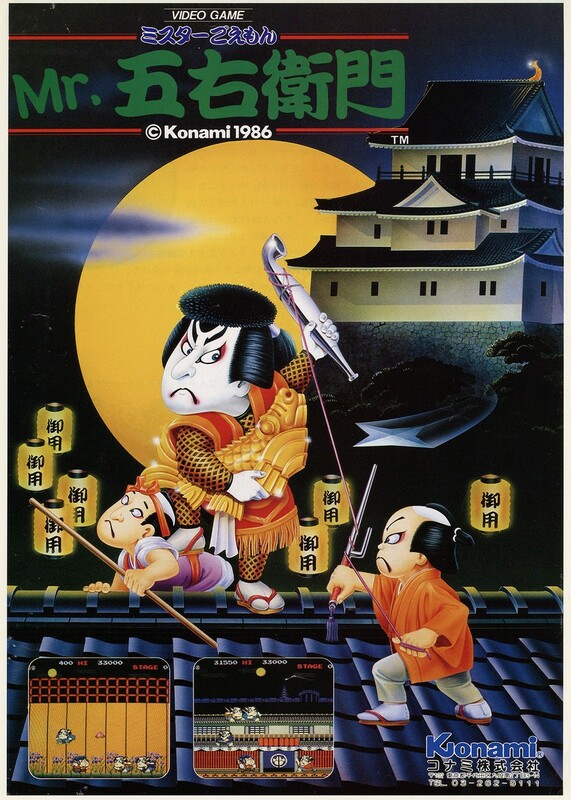 Goemon) is a platform arcade game that was released by Konami in 1986 only in Japan; it utilises the same hardware as Green Beret (a Zilog Z80 running at 3.072 MHz with a Texas Instruments SN-76496 running at 1.536 MHz for audio), and was the penultimate title from the company that featured their "original" logo on its title screen. The player must use a 4-way joystick to take control of the resurrected Japanese outlaw, Ishikawa Goemon (1558-1594), with two buttons to make him strike the various enemies with his Kiseru pipe (which he also smokes after picking up the gold chests at each stage's halfway point) and throw collectable objects at them (the stages' bosses, with the exception of the wig-throwing ones on the second stage, can also only get killed by these) - and at the end of each stage, he distributes his gold over a village, causing the lights in its houses to turn on (except for the final one, where he has to collect the Golden Lamp, for a 10000-point bonus). This is the first game in the Legend of the Mystical Ninja series; it was followed by twenty-two sequels upon various Nintendo consoles, Sony consoles and mobile phones. On June 2, 2010, the game was made available by Microsoft, for download to the Xbox 360 console and Microsoft Windows operating system as a part of their Game Room service (and not just in Japan) - and on December 25, 2014, it was made available for download to the Sony PlayStation 4 by Hamster Corporation, under the name of Arcade Archives: Mr. Goemon in Japan (and later in the US on September 22, 2015, and in both the EU and Australia a month later, on October 27 of that year). Although nine secret trophies, seven bronze and two gold, have been added to the game, they are earned by performing basic actions like opening the online rankings and game settings, resetting the game, setting the new highest score, or reading all of the virtual manual; this version got rated 6/10 by Brash Games on November 25, 2015. This page was last edited on 22 February 2017, at 17:34.